St. John’s – As of today, it is legal for people over the age of 19 to purchase and consume recreational cannabis in Newfoundland and Labrador. For many people, talking about personal cannabis use with their doctor can be difficult or awkward. Some patients may feel embarrassed or fear they will be judged. That’s why the NLMA has launched a new social media campaign and website called oktotalk.ca to let members of the public know it’s OK to talk to their doctor about how cannabis use might affect their health. “We know that some people may have been reluctant to talk to their doctor about their cannabis use when it was an illegal drug. We want patients to know that doctors are here to listen to patients’ concerns about how using any substance might affect their health,” said NLMA President Dr. Tracey Bridger. “It’s also important for people to know that just because cannabis is legal, that doesn’t mean it’s safe. There are many misconceptions about cannabis ― for example, that it isn’t addictive or that it isn’t harmful because it comes from a plant. We want people to understand the health risks associated with cannabis use so they can make informed decisions now that it is available to consumers,” Dr. Bridger said. The NLMA has developed a promotional video that will be used on social media and shown in movie theatres in the province. 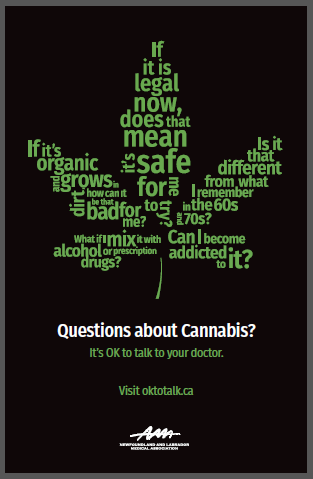 The website ― oktotalk.ca― features answers to some of the common questions about cannabis use and provides information about the known health risks.